When most people hear the word 'coil over', the immediately think 'racing suspension', and consequently, 'rough ride'. With H&R, great handling and great ride go together. H&R is the originator of the true coil over system for the street and continues to lead the market with an extensive line of applications. Each shock is tuned with a proggressive rate spring that is engineered from its inception to work with the shock's valving, creating a finely tuned suspension system. Equally at home on the street or at the track, H&R Coil Overs are the suspension answer for the serious tuner. Height adjustment is done by turning the lower spring perch on the front strut to raise or lower the spring. Spanner wrenches are included. In the rear, the spring is set inboard of the wheel. The ride height is adjusted by a perch underneath the spring. Simply unbolt the shock to ease tension on the spring and turn the perch to raise or lower the height. 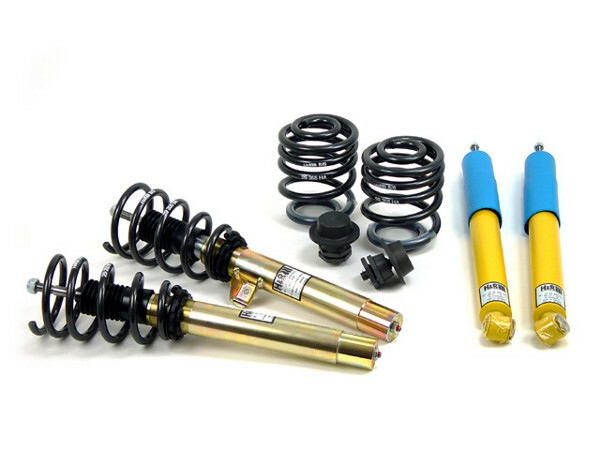 Included with the H&R Coil Over for the E46 M3 are: 2 front struts with gas-pressure inserts, 2 rear gas-pressure shocks, 4 progressive-rate H&R springs, spring seats and perches, rear ride height adjusters, and spanner wrenches. H&R offers a lifetime warranty on the shocks. The Coil Over is installed using factory front and rear mounts (an upgraded rear shock mount is available, see below).